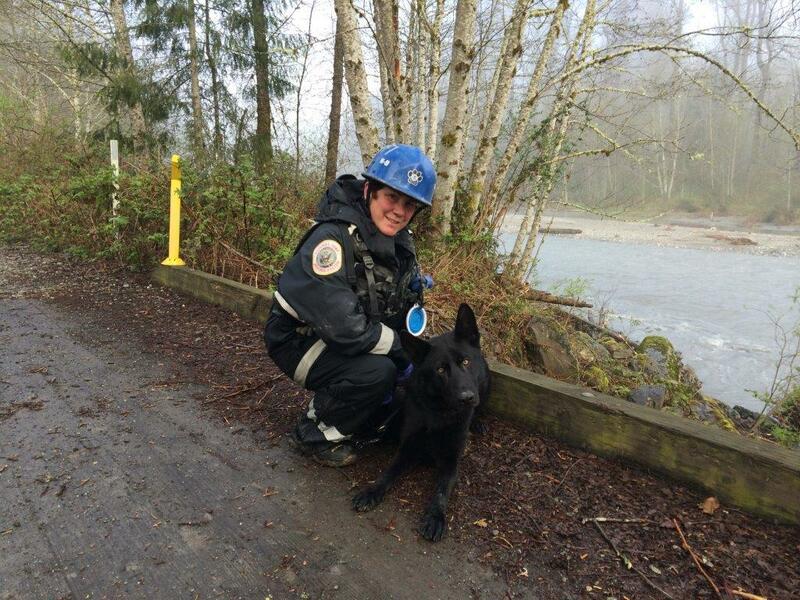 Michelle Bufkin, AU Agriculture Communications Student/ EDEN Community of Practice Social Media Assistant, recently interviewed Dr. Melissa Newman to learn about search and rescue dogs and about her experience in Oso. Here is part 2 of Michelle’s interview with EDEN delegate Melissa Newman. 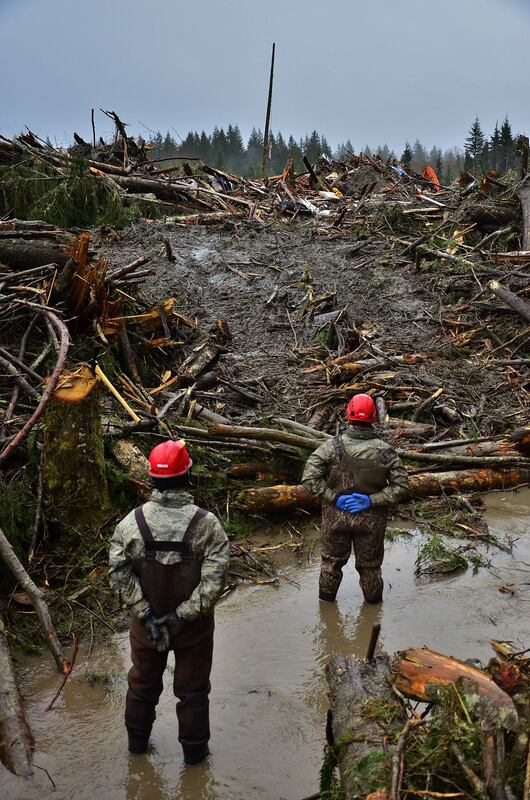 How was the Oso mudslide similar or different from other conditions you have worked with your dog? It was absolutely completely different. There was no way I could have prepared or trained my dogs for that. This mudslide was so much bigger than anything I could explain. There was more than just a little bit of mud. We were talking anywhere between 10-40 feet of mud. There were trees, houses, anything in its way it just pushed, it was said that the winds in front of the mudslide were in excess of 200 mph. They had huge excavators from the lumber companies and they were running everywhere creating noise; I could not have trained that situation, but because of the other training we had given the dogs they were prepared for it. Dog experts say that dogs don’t generalize, but I think you can train them to; when you keep taking them to different rubble piles they start to realize that the conditions don’t matter, they just need to do their job. But the mud was crazy, I sunk at one point all the way up to my chest and it took six men to dig me out because the mud was so deep and thick. These dogs maneuvered over all of this, got stuck in the mud, pulled themselves out. It was absolutely incredible, I was impressed with all of the dogs there, not just mine. There were 20 dogs there sent by FEMA, split into two groups of 10 dogs. I worked with the 10 dogs that were in my group and one dog was as good as another. Did the mud from the slide mess up the dog’s senses? Working the slide was actually difficult for the dogs because there were places where the odor did not come straight out. There was a lot of water because the slide rerouted a river, so the dogs would find odor in the water, and they were right, but that was not where we needed to dig. So what we did for the most part was once a dog sensed odor we would send in another dog to better locate a high priority place to dig. It was difficult for the dogs originally because they were not getting rewarded even though they thought they were at source. There was just so many feet of mud, and it rained out there probably 11 or 12 of the 14 days we were there, so the mud never dried; which may have actually helped us because if it had dried it would have made a cast that really would have kept the odor down. It was tough work, and unfortunately because there were so many fatalities that meant there was an odor everywhere. The dogs adjusted to it, but no dog by itself had a find. It was absolutely a team effort. When we went out, there were 12 people missing still, when we left that number was down to two. With such a large area of debris, how did you focus a search? They separated the areas geographically. There was a natural break in the mudslide to the east and west, so they split down that. I was assigned with the California Task Force 7, who hosted us. We worked the western side of the slide. They broke it down in grids, so we just worked the dogs in those grids and cleared our portion of it. The other group was assigned to Washington Task Force 1 and worked the same way on the east side. The excavators had their own grid, they would dig to natural surface and then move and dig to natural surface there. What made this a unique deployment is this was the first time that FEMA sent FEMA certified human remains detection dogs, they have used HR dogs before. They also did the first modular deployment ever, which means only handlers and their dogs were sent to Washington, instead of our entire task force. They did this because California Task Force 7 and Washington Task Force 1 were already in place, all they needed more of was handlers and dogs. 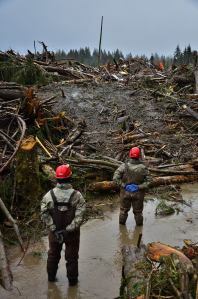 I know the conditions in Oso were extreme. How long can a dog successfully work in conditions like that? It varies. When we went out originally we were working 10-hour days, but they quickly realized they did not want to exhaust all of the dogs at once. So they put us on a rotation where we would either get a morning or an afternoon off every other day. We were working 4-hour shifts, and during those 4 hours the dogs were not going non-stop. On the first few days we did the wide, cover it and screen it, and they got GPS points to focus on from there. Then we came back and targeted those areas. Personally, I would have liked to work my dog more, but the way they handled him he worked very hard and very well. Two things we were concerned about were dehydration and hypothermia. We had to put them in warming tents and make sure they had fluids whenever we were not working. After seeing the disaster first hand, is there any advice you would give our readers to help recover from a natural disaster like this? This community was pretty spectacular, they just handled it. This slide took out a major road between two towns,so all they had now was a logging road south of the incident; the day I got there it was a one-lane rough road, and when I left most of it was two lanes and resurfaced. The community was really good about taking care of people, we had thank you notes in our laundry and lunches, there were people that were doing our laundry for free to support us. As a community they knew where their resources were, their fire departments responded immediately. Knowing what resources you have available to you in state is critical. The communities need to know the details of where to get state support before an incident occurs. I can’t see anything that this community could have done differently to help in recovery. They managed their donations really well by documenting when people picked things up. People forget about that, because after a disaster donations will be made, so that raises the need for somewhere and someone to manage the donations. I guess that is a lesson learned for other communities, never underestimate the amount of stuff the community will receive. It truly was an honor to help this community because they are so sad, and if you can help them it’s good to be able to do that. Didn’t see the first part of the interview? Read it here. Thanks to University of Kentucky Point of Contact Andrea Higdon, we learned that Dr. Melissa Newman and her rescue dog had been deployed to Oso to help find people buried by the mudslide. Melissa is an associate professor at the University of Kentucky and an EDEN delegate. 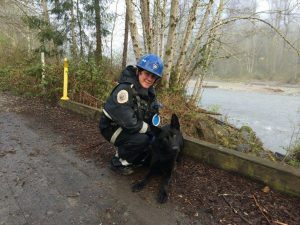 Michelle Bufkin, AU Agriculture Communications Student/EDEN Community of Practice Social Media Assistant, recently interviewed Melissa to learn about search and rescue dogs and about her experience in Oso. Below is part one of the interview. Can you tell us how you first got involved with EDEN, and what your role is? I have been working with EDEN for about 12 years now. Originally I was just curious, but then I got involved here at the University of Kentucky with Andrea Husband and Roberta Dwyer. We received funding through grants and have not turned back since. We have done an online program and got involved with the S-CAP, Strengthening Community Agrosecurity Preparedness, Project. It just became one neat thing after another. We love working together. It is also one of the passions I have: I am a deputy sheriff, a firefighter and with the task force, so it all fits together. How did you get involved in search and rescue and why did you get into the human remains detection part of search and rescue? According to my mother, I have always been interested in canine work. Many years ago, a little kid went missing near my home in the middle of nowhere Kentucky. I offered my assistance since I had endurance horses and could ride trails. They sent me away saying they did not need my help. That is the only search I have ever been on that sent anyone away. So when I got my next dog I sought out a state organization to learn about search and rescue. I did not know whether the dog or I could do it, but luckily I was gifted with a dog that absolutely loved the work. I started out just doing wilderness search and rescue, which is when a little kid goes missing in the woods you go find them, or so I thought. When the first three finds I had were deceased victims, I started to realize that, at least in Kentucky, people don’t just get lost because there is a McDonald’s within a mile if you walk in a straight line. When people go missing in Kentucky, a lot of times, it is because something bad has happened to them. My dog was probably 2 years old when I actually started training him to be a human remains detection dog. I certified him through the North American Police Work Dog Association, because at that time all of the human remains detection dogs had to be certified through law enforcement. He was the first of many trained dogs for me. It took a mindset shift, to remind myself that I am now looking for deceased people, but it only took one search for me to recognize that bringing the loved one home is critical to the healing of the family. It is not a pleasant thing to go do, but it really does help the families. I always tell this story to explain where I am coming from: Very early in my career, I went on a search for a drowning victim, the dog and I were in the boat with our life vests on: I look over and see a woman sitting on a dock with her legs crossed, just looking out over the water, the driver of the boat tells me that she is the wife of the man we are looking for. It really hit me that she needed him back, alive would have been much better, but she needed closure. That’s how I started and that’s one of the main reasons why I keep a really good attitude about it, because I am working for the family at that point. How long have you trained and handled search and rescue dogs? And what breeds do you use? I have trained and handled these dogs for 15 years. I actually just lost my first dog in December. He was over 15 years old. I predominantly use German Shepherds, but for my Federal Emergency Management Agency, live-find work, I have a Labrador and a Dutch Shepherd, because to do the work for FEMA they have to be so athletic and over the top ready to work; they can’t be affected by the environment. I go with the best dog, not necessarily the best breed, but I am biased to German Shepherds because I love them. The traditional FEMA dog is a live-find dog. It was not until August of last year (2013) that FEMA allowed task forces to have human remains detection dogs. This was because FEMA’s objective was to get there very quickly and find everyone alive and save them. But they realized when they’re coming in days after an event occurs they still need to help in the recovery process so the community can move on. Can you give a detailed description of how your dog does its job? They work by smelling the air. My job is to get him in a position to have the wind blown to him, much like a bird dog works. We refer to this as air scent search dogs, as opposed to a traditional tracking dog, which a lot of people think of as a bloodhound with his nose on the ground. My dogs work off-lead. Most of the time they work without collars because we are sending them into hazardous conditions and don’t want them to get hung up on anything. We’ll send them into the area, they’ll cover the area smelling the wind and if they detect the presence of human remains, they will go to that location and get as absolutely as close as they can. We train them nose to source. The closeness is really critical in law enforcement, but we use it for disaster dogs also. They get to that point and then bark until the handler gets there to say good boy. My dogs are working towards a paycheck of a toy, different dogs have different rewards but I have found toys work best for them. Some people try to reward with food, the problem with that is that, at some disasters there are people’s kitchens with refrigerators full of food so the dog will eat while working, and not get a lot of work done. With my dogs, they know that I am the one that has his toy, so he has to find something for me to reward him. Today’s post is written by Megan McConville. She manages the National Association of Development Organization (NADO) disaster recovery and resilience program. We (Rick Atterberry, Steve Cain, Abby Hostetler and Virginia White) met Megan during a recent visit to Washington, D.C. You can contact her at mmcconville@nado.org. 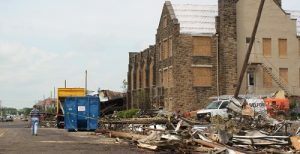 As the storms subsided and the floods receded, communities were left with the daunting tasks of cleaning up and repairing damaged infrastructure. Bridges and culverts needed replacing, roads needed resurfacing, and drainage ditches needed clearing. What’s more, this series of natural disasters made it clear to state, regional, and local leaders that businesses are tremendously vulnerable to extreme weather. They can suffer costly damage, be cut off from supply lines, lose sales, and experience interrupted operations. In some cases, they may even be forced to close permanently. When businesses and industries fail or falter, the communities they serve can feel serious impacts, ranging from the lack of access to goods and services to the loss of income and jobs. In response to this need, SWAPDD—one of Arkansas’ eight regional planning and development districts—used disaster recovery funds from the U.S. Economic Development Administration (EDA) to develop a comprehensive database of information on the employers and infrastructure in the region. The database will help southwest Arkansas recover from future disasters much faster and more effectively, as it establishes a baseline for the region’s economy which can be overlaid with geographic information about a disaster’s impacts—such as floods and tornado tracks—to immediately estimate the number of affected businesses and employees, identify damage, and mobilize repair and assistance efforts. SWAPDD is also using it to identify potential federal and state funding opportunities for local partners, submit applications, request letters of support for projects, and fill out environmental review and other forms with the touch of a button. Want to know how SWAPDD created such a great tool? Check out the new case study series from the National Association of Development Organizations (NADO) Research Foundation, titled Lessons from the Storm: Case Studies on Economic Recovery and Resilience. The series highlights how regional development organizations have used 2008 disaster recovery funds from EDA to address the impacts of natural disasters, become more resilient to future events, and increase long-term economic competitiveness and quality of life in their regions. SWAPDD’s story is posted there, and more case studies are coming soon. NADO is a national membership association that provides advocacy, capacity-building, and research services for the network of over 500 regional planning and development organizations across the U.S. Regional planning and development organizations—known locally as regional planning commissions, councils of governments, area development districts, or similar terms—play a key role in community and economic development, transportation planning, business development finance, technology and telecommunications, workforce development, GIS analysis, and other issues important to their local government partners. Disaster recovery and resilience is a key area of work for the NADO Research Foundation and for our members. Along with Lessons from the Storm, we are collaborating with the International Economic Development Council to provide training, technical assistance, and best practice research on economic resilience for communities and regions in the northeast and southeast that were affected by disasters during fiscal year 2011. We have hosted several peer-to-peer workshops on disaster preparedness and recovery and have produced reports and policy briefs on topics such as integrating hazard mitigation planning, sustainable community development approaches, and economic development strategies; transportation system recovery; and frameworks for regional development organizations to use in preparing and responding to economic shocks. Additionally, we are helping our members incorporate disaster resilience into their EDA-required Comprehensive Economic Development Strategies and other regional plans. Severe weather and climate change have become costly and unpredictable parts of our lives. However, local leaders can learn a lot from each other about planning for disasters during so-called “blue-sky” periods, building partnerships, pursuing non-traditional funding sources, encouraging community engagement, and seizing the abundant opportunities to build back better following an event. By sharing stories and strategies neighbor-to-neighbor, across networks like EDEN, and through case studies and other online resources, we can be better prepared the next time the storm clouds gather. [i]EDA Disaster Response and Preparedness Plan. University of Arkansas at Little Rock Institute for Economic Advancement. 2010. http://iea.ualr.edu/pubs/2010/10-04%20EDA_DRPP.pdf. [ii] Hurricane Ike Impact Report. Federal Emergency Management Agency. 2008. http://www.fema.gov/pdf/hazard/hurricane/2008/ike/impact_report.pdf. [iii] Dycus, Renee. Personal interview. June 17, 2013.